Thomas McIntosh is an internationally recognized artist that has challenged the boundaries of media and interactivity inviting observers to reconsider what is the relationship between the materiality and immateriality of physical media and contemporary technology. 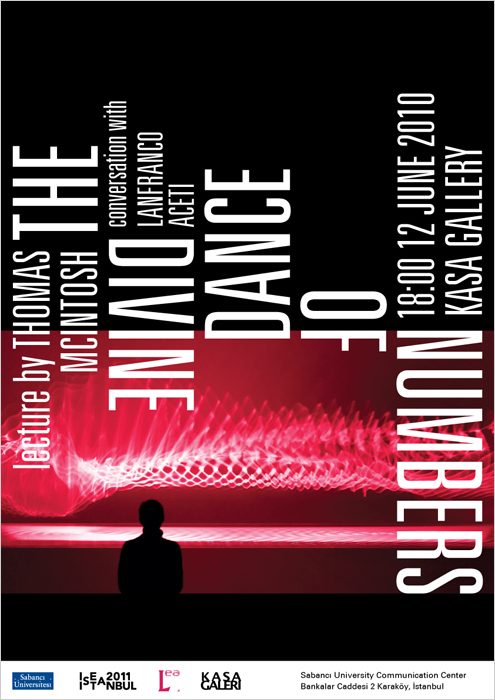 Thomas McIntosh will be giving a lecture at Kasa Gallery, as part of the Sabanci University's lectures, on June 12, 2010 at 6pm following the installation of Ondulation in Istanbul at the Borusan Gallery for the Matière-Lumière exhibition curated by Richard Castelli – an artwork authored together with Emmanuel Madan and Mikko Hynninen. Thomas McIntosh is a founding member of The User and art collective in collaboration with composer Emmanuel Madam. The lecture will offer the opportunity to engage with the aesthetic and philosophy of McIntosh as well as provide an exchange with the audience on future developments in the fields of contemporary interactive artworks. The lecture will take place June 12, 2010, from 18:00 to 19:30. It will be followed by a conversation between the artist and Prof. Lanfranco Aceti. Please click here for the text.